Companies all over the world are looking for sources of the rare earth metals used in high-tech devices. Some of the biggest stores are in the former Soviet republics of Central Asia. China's decision to drastically cut exports of rare earth metals in 2010 has forced manufacturers of products from iPhones to satellite systems to look for new sources in Central Asia. China is the world's dominant producer of rare earths, accounting for 97 percent of production in 2009, so its move in the second half of 2010 to reduce export quotas by more than 70 percent sent shock waves among manufacturers who depend on Chinese imports. Demand for rare earths, which have a wide variety of uses in high-tech products, is increasing rapidly. According to a report from Eurasia Capital, global demand for rare earths currently runs at about 134,000 tons per year, which is expected to rise to 180,000 tons by 2012 and may exceed 200,000 tonnes by 2014. "Total world… demand is expected to exceed global production by 2014 and processing existing above-ground inventories, as is currently done to meet production shortfalls, will not be enough," the report says. This has inevitably set off a race by consumers of such minerals to tie up supplies from other countries that possess large deposits of rare earths in concentrated and economically exploitable forms, such as Mongolia and Russia, as well as Central Asian countries such as Kazakhstan, Uzbekistan and Tajikistan. The Federation of German Industry, the BDI, for one has been in negotiations for several months with the aim of signing an exclusive raw materials partnership with Kazakhstan, Reuters reported in late January. By signing partnership agreements with Kazakh companies, Germany hopes to get access to materials, in particular rare earths, that are not readily available on world markets. According to the newswire, BDI is in talks with several mid-sized companies and has received a positive response so far, although the talks are still at an early stage. Kazakhstan possesses ores bearing beryllium, tantalum and hafnium, which is used to create control rods for nuclear reactors, according to Visor Capital analyst Stanislav Chuyev. The country already produces rhenium, tantalum, gallium and other metals, with major rare earth operations being supervised by Kazakhstan's state-owned nuclear holding company Kazatomprom. 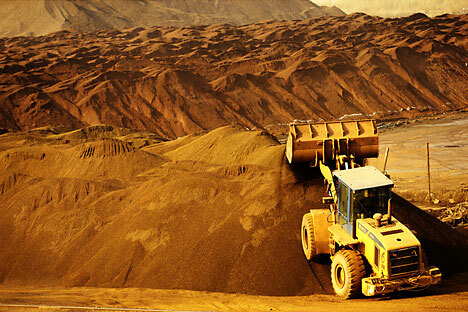 However, Chuyev said, at present three-quarters of ores are exported to Russia and 20 percent to China. Germany is by no means the only country on the hunt for new suppliers of rare earths. Chuyev says the main interest in developing Kazakhstan's rare earths comes from Japan. Kazatomprom already has a joint venture with Sumitimo to extract rare metals including molybdenum and rhenium from uranium ore, and in March 2010 signed a deal to set up another joint venture with Toshiba, which will widen the range of rare earths produced in Kazakhstan. In Mongolia, which according to Eurasia Capital has the world's largest deposits of rare earths after China (31 million tons according to the 2009 U.S. Geological Survey), the Japanese government signed an agreement in 2010 to jointly explore the country's rare earth production potential. And Japanese Economy, Trade and Industry Minister Banri Kaieda struck a deal with the Uzbek government in February 2011 to jointly explore and develop deposits of uranium and rare earths there. South Korean manufacturers are also looking to secure new sources of rare earths. State controlled Korea Resources Corporation plans to target Africa, Central Asia, Mongolia and Vietnam, the company's CEO Kim Shin Jong said in December 2010. Elsewhere in the Central Asia region, Stans Energy announced plans in January 2011 to buy the past processing plant next to the north Kyrgyzstan Kutessay II rare earth metals mine, where it holds a 20-year licence. Meanwhile, Kazyna Capital Management, the private equity arm of Kazakhstan's Samruk-Kazyna sovereign wealth fund, recently set up the Kazakh-Tajik Private Equity Fund, and according to KCM chairman Abay Alpamyssov, rare earths is a potential area of investment. "China currently has a monopoly on rare earth metals production, but Tajikistan is also rich in such minerals," Alpamyssov said. A Russian company, Converse Group plans to start production of recycled vanadium at Vostokredmet, the Oriental Industrial Complex of Rare Metals, in Tajikistan's second city Khujend, Asia Plus reports. The vanadium will be sold back to Converse for the Russian market.